Who needs PXE for Citrix Provisioning Services? With Citrix Provisioning Services (PVS) the content of a disk can be streamed to a (virtual / physical) machine via the network. A (virtual) machine that boots needs a bootstrap to locate a PVS server (that has a vDisk available) and the ability to stream the disk to the machine. The bootstrap, the Boot Device Manager (BDM), needs to be delivered to the machine. It is common to deliver the BDM bootstrap via a Pre Execution Environment (PXE) network boot, but it’s not required. Although the PXE method seems the most straight forward method (and most advocated), it it difficult to make it resilient. The Pre Execution Environment (PXE) method depends on a DHCP request, a PXE and a Trivial File Transfer Protocol (TFTP) server. After the machine sends a DHCP request it receives a DHCP response that contains the PXE server to contact. The PXE server streams the Boot Device Manager (BDM) to the machine via TFTP. After the machine has loaded the Boot Device Manager (BDM) the actual streaming of the vDisk via PVS starts. 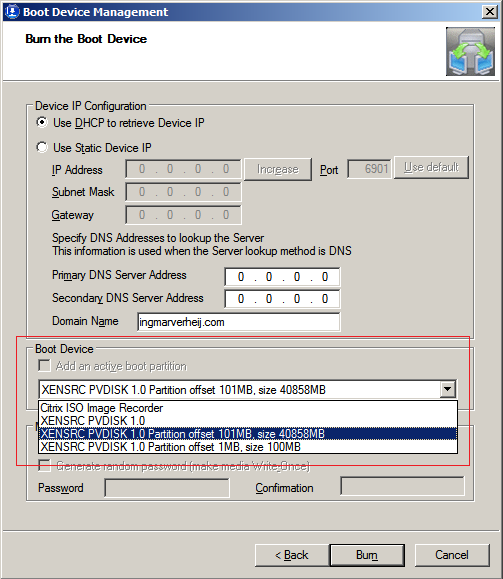 It is possible to deliver the Boot Device Manager (BDM) bootstrap directly to the machine, without using PXE and TFTP. With the ‘Provisioning Services Boot Device Manager’ tool you can easily create an ISO image (of 300K) which you can mount to your virtual machines. Especially in a virtual environment it is very easy to mount a ISO to a virtual machine. By mounting the ISO in the virtual machine template used in XenDesktop the correct boot image is always used. Alternatively the BDM bootstrap can be burned on a CD that you’ll leave in a physical machine or store the bootstrap on the physical disk. It is even possible for OEMs to embed the bootstrap file on the target device, but I haven’t seen a device that has it embedded yet. The BDM bootstrap is run in a limited environment and therefore has a limited support for Network Interface Cards (NIC). There are some compatibility issues with certain virtual adapters in common hypervisors (Hyper-V 2.0 requires legacy NIC adapter, vSphere requires VMXNet3, etc.). So mounting the BDM via an ISO, instead of providing via PXE, does not make it easier to use it on Hyper-V 2.0. Sorry Remko! After releasing this article a few people on Twitter suggested it would be very nice if a PowerShell script existed that could mount the ISO (containing the Boot Device Manager) to a virtual machine. The much appreciated and fellow blogger Andrew Morgan (LinkedIn, Twitter, Website) picked up the glove and accepted the challenge! Andrew wrote a PowerShell script that automatically mounts the ISO to a specified list of virtual machines. You can download the script here: VMWare- MountIsoToVMs.ps1. The use of this script is at your own risk. Nor the author (Ingmar Verheij) or the creator (Andrew Morgan) take any responsibility for the consequences if the script is run incorrectly. Can i connect to the VMware Infrastructure server ($viserver)? Does the virtual machine ($vms) have cd drive? Is the virtual machine ($vms) powered on? Andrew wrote the script for a VMware Infrastructure (VI) environment. If you created a similar script for a different hypervisor (XenServer / Hyper-V) and want to share it here, contact me.